After a long and exhausting flight from Phoenix to Auckland, I was happy to have a nice bed to sleep in at Yapping House Hostel, and after a long 12 hour nap, it was time to explore the city. We hopped on a city bus to go downtown, and quickly realized that unlike back home, the bus stops were not announced here, so we had to guess when to get off and ended up following a crowd of the locals. To make things more confusing, once we got off the bus, we realized that we left our map and book at the hostel! Oh dear, obviously we are still learning. Not sure where to start, we decided to make our way to the only landmark we knew, The Sky Tower, which is the highest building in Auckland. Luckily we also found the tourist information center, which had some free maps and info on how to spend our day. 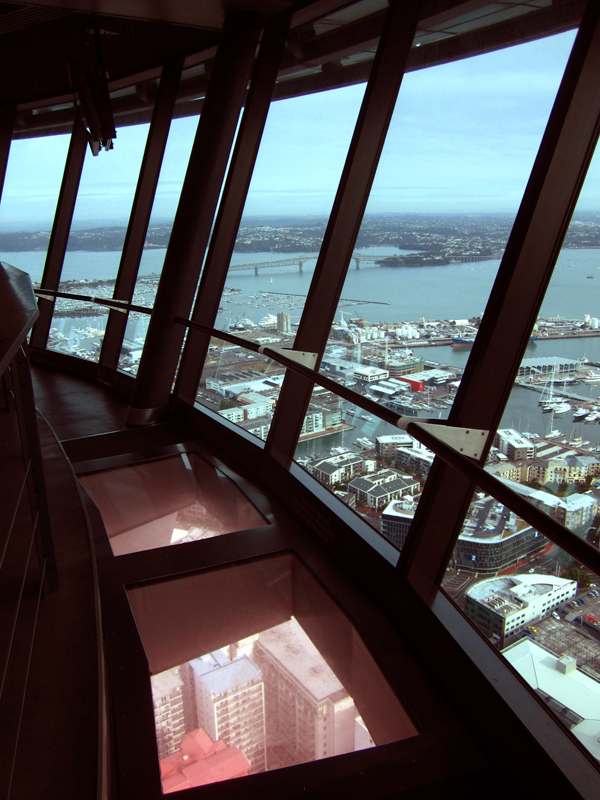 First we headed up the Sky Tower to get a hold of our bearings. The Sly Tower is the same concept as The CN tower in Toronto, with a glass floor and everything, but not nearly as tall, so it is slightly anti-climatic. 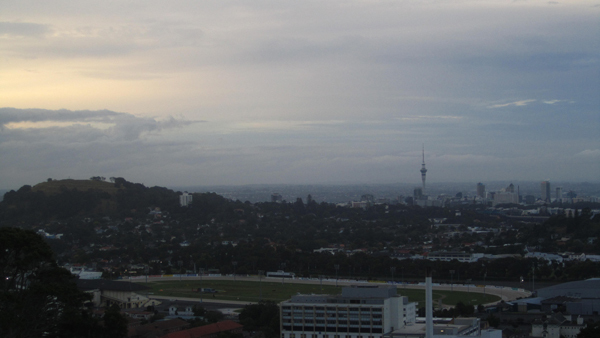 Regardless, it was still interesting to see the Auckland skyline. Our next stop was the Auckland Art Gallery, which has been free since it first opened in 1888 (pretty impressive if you ask me). It was a great collection of both modern and Historical art, and offered a great look at some traditional Maori and Pacific Islands artists works. Next it was time to pick up our camper van, which I soon learned was actually a camper station wagon. It was a bit smaller than expected, but it had everything we needed. We filled her up with groceries for the week and then finished the day with a trip to the free Auckland War Memorial where we saw some very cool Maori artifacts including a 25ft wooden canoe carved out of a single tree, and a hike up One Tree Hill where we saw lots of sheep and cows, and a great view of Auckland’s landscape. We had one last night in our hostel, and the next morning it was time to head out on our one month New Zealand camping experience. Unfortunately, in the morning when we were pumped to get going, our car battery died, and we couldn’t get the car started. Luckily, we were still in town, and the rental company came and brought us a new car, which was a newer model. finally, after we moved everything to the other car, we were all set to go, and tried again. 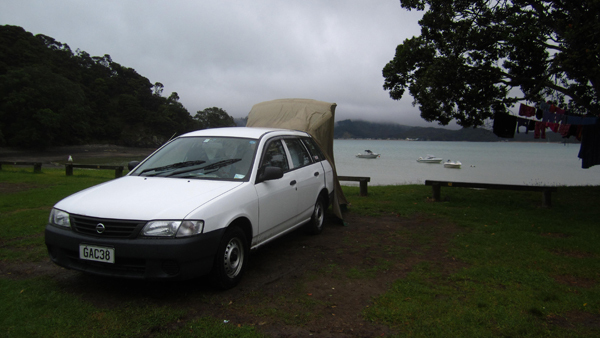 We said good bye to Auckland and hit the road. LOVE the car! I can picture the two of you blazing down the road, blaring some tunes and laughing about a million and one random things. Just keep an eye on the road will you? There’s sheep EVERYWHERE! Happy Trails Shannon! I think about you daily. The car is amazing, i LOVE it. Unfortunatley we only have a radio in the car, and there dont seem to be many stations in NZ, but the scenery is enough to keep us in awe while we drive! Tyron fried us up some delicious lamb chops last week that were GREAT!